Geologic-hazard maps generally show areas that may be subject to the effects of earthquakes, landslides, debris flows, rock falls, poor soil conditions, radon, or floods. The main purpose of geologic-hazards maps is to identify where geologic hazards may be present and where additional evaluations are needed to assess hazards and recommend mitigation measures prior to development. This list of primarily UGS maps is not comprehensive for each region. Additional geologic-hazard publications are available at Geologic Hazard Publications, Paleoseismology of Utah, and the UGS Library. Geologic-hazard maps are listed under individual counties or the statewide listing. Geologic hazard publications may also be available for this county. Currey, D.R., Atwood, G., and Mabey, D.R., 1984, Major levels of Great Salt Lake and Lake Bonneville: Utah Geological and Mineral Survey Map 73, scale 1:750,000. Elliott, A.H., and Harty, K.M., 2010, Landslide Maps of Utah, Utah Geological Survey Map 246DM, 14 p., 46 plates, 1:100,000 scale, DVD. Bishop, C.E., 1998, Radon-hazard potential of Beaver basin area, Beaver County, Utah: Utah Geological Survey Special Study 94, 39 p., 20 figures, approximate scales 1:178,600 and 1:2,777,800. Christenson, G.E., and Shaw, L.M., 2008, Geographic Information System database showing geologic-hazard special study areas, Wasatch Front, Utah: Utah Geological Survey Circular 106, 7 p., GIS data, scale 1:24,000, compact disk. Harty, K.N. and McKean, A.P., 2015, Surface fault rupture hazard map of the Honeyville quadrangle, Box Elder and Cache Counties, Utah: Utah Geological Survey Open-file Report 638, 1 plate, scale 1:24,000, compact disk. McDonald, G.N., and Ashland, F.X., 2008, Earthquake site conditions in the Wasatch Front urban corridor, Utah: Utah Geological Survey Special Study 125, 41 p., 1 plate, scale 1:150,000, compact disk. McDonald, G.N., Hiscock, A.I., Kleber, E.J., and Bowman, S.D., 2018, Detailed mapping of the Wasatch fault zone, Utah and Idaho – Using new high-resolution lidar data to reduce earthquake risk: Final technical report to the U.S. Geological Survey, National Earthquake Hazards Reduction Program, award no. G17AP00001, 39 plates, scale 1:24,000. Solomon, B.J., 1999, Surficial geologic map of the West Cache fault zone and nearby faults, Box Elder and Cache Counties, Utah: Utah Geological Survey Map 172, 40 p., 2 plates, scale 1:50,000. Anderson, L.R., Keaton, J.R., and Bay, J.A., 1994, Liquefaction potential map for the northern Wasatch Front, Utah, complete technical report: Utah Geological Survey Contract Report 94-6, 150 p., 6 plates, scale 1:48,000. Lund, W.R., editor, 1986, Engineering geologic case studies in Utah, 1986: Utah Geological and Mineral Survey Special Study 68, 94 p., 16 plates, various scales. McDonald, G.N., and Ashland, F.X., 2008, Earthquake site conditions in the Wasatch Front urban corridor, Utah: Utah Geological Special Study 125, 41 p., 1 plate, scale 1:150,000, compact disk. McCalpin, J.P., and Solomon, B.J., 2001, Seismic-hazards mapping of the central Cache Valley, Utah – a digital pilot project: Final Technical Report, National Earthquake Hazards Reduction Program, Award No. 1434-HQ-98-GR-00024, Program Element I: Products for Earthquake Loss Reduction, 59 p., 12 plates, scale 1:24,000. Utah Geological Survey, 2003, Liquefaction potential map for Cache Valley, Cache County, Utah: Utah Geological Survey Public Information Series 79, 2 p., 1 figure, approximate scale 1:166,700. Black, B.D., and Solomon, B.J., 1996, Radon-hazard potential of the lower Weber River area, Tooele Valley, and southeastern Cache Valley, Cache, Davis, Tooele, and Weber Counties, Utah: Utah Geological Survey Special Studies 90, 56 p., 1 plate, scales 1:50,000 and 1:100,000. Solomon, B.J., and Black, B.D., 1996, Radon-hazard potential in southeastern Cache Valley, Cache County, Utah: Utah Geological Survey Public Information Series 46, 2 p., 1 figure, approximate scale 1:57,500. McDonald, Greg N., and Giraud, Richard E., 2013, Preliminary landslide inventory map of the 2012 Seeley fire area, Carbon and Emery Counties, Utah: Utah Geological Survey Open-file Report 612, 1 pl., scale 1:24,000, CD. McDonald, G.N., and Giraud, R.E., 2014, Landslide inventory map of the 2012 Seeley Fire area, Carbon and Emery Counties, Utah: Utah Geological Survey Special Study 153, scale 1:24,000, CD. 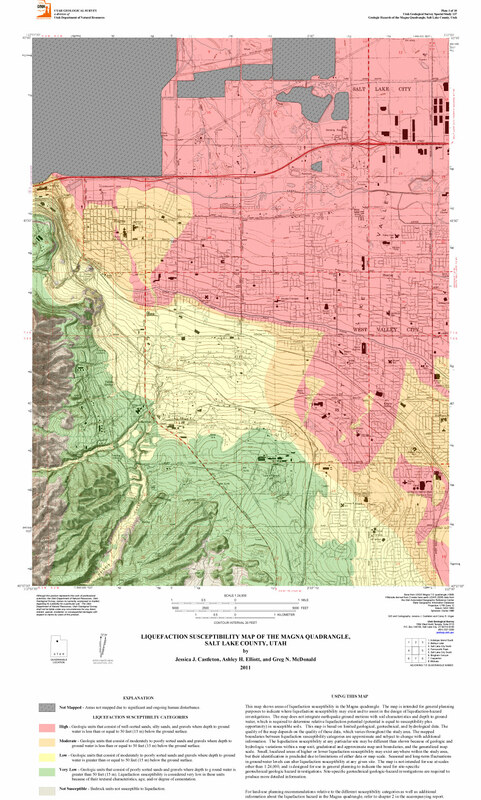 Personius, S.F., and Scott, W.E., 2009 (digital release), Surficial geologic map of the Salt Lake City segment and parts of adjacent segments of the Wasatch fault zone, Davis, Salt Lake, and Utah Counties, Utah (digitized from U.S. Geological Survey Miscellaneous Investigations Series Map I-2106 ): Utah Geological Survey Map 243DM, GIS data, scale 1:50,000. Utah Geological Survey Staff, 1990, Earthquake fault map of a portion of Davis County, Utah: Utah Geological Survey Public Information Series 2, 2 p., 1 figure, approximate scale 1:96,000. Anderson, L.R., Keaton, J.R., Aubrey, K., and Ellis S., 1994, Liquefaction potential map for Davis County, Utah, complete technical report: Utah Geological Survey Contract Report 94-7, 50 p., 8 plates, scale 1:48,000. Anderson, L.R., Keaton, J.R., and Eldredge, S.N., 1994, Liquefaction-potential map for a part of Davis County, Utah: Utah Geological Survey Public Information Series 24, 2 p., scale 1:200,000. Harty, K.M., and Lowe, M., 2003, Geologic evaluation and hazard potential of liquefaction-induced landslides along the Wasatch Front, Utah: Utah Geological Survey Special Study 104, 40 p., 16 plates, scale 1:24,000. Black, B.D., 1996, Radon-hazard potential in the lower Weber River area, Weber and Davis Counties, Utah: Utah Geological Survey Public Information Series 45, 2 p., 1 figure, approximate scale 1:71,400. Giraud, Richard E. and McDonald, Greg N., 2017, Landslide inventory map of the Ferron Creek area, Sanpete and Emery Counties, Utah: Utah Geological Survey Special Study 161, 1 pl., scale 1:24,000. Giraud, Richard E. and McDonald, Greg N., 2019, Landslide inventory map of Seely Creek and Big Bear Creek drainages, Sanpete and Emery Counties, Utah: Utah Geological Survey Special Study 164, 1 pl., scale 1:24,000. Anderson, R.E., and Christenson, G.E., 1989, Quaternary faults, folds, and selected volcanic features in the Cedar City 1° x 2° quadrangle, Utah: Utah Geological and Mineral Survey Miscellaneous Publication 89-6, 29 p., 2 plates, scale 1:250,000. Castleton, Jessica J., Erickson, Ben A., and Kleber, Emily J., 2018, Geologic hazards of the Moab quadrangle, Grand County, Utah: Utah Geological Survey Special Study 162, 33 p., 13 pl.,scale 1:24,000. Hylland, M.D., and Mulvey, W.E., 2003, Geologic hazards of Moab-Spanish Valley, Grand County, Utah: Utah Geological Survey Special Study 107, 25 p., 4 plates, scale 1:24,000. Mulvey, W.E., 1992, Geologic hazards of Castle Valley, Grand County, Utah: Utah Geological Survey Open-File Report 238, 31 p., 4 plates, scale 1:24,000. Kaliser, B.N., 1978, Ground Surface Subsidence in Cedar City, Utah: Utah Geological Survey Report of Investigation 124, 22 p., 1 plate, scale 1:24,000. Williams, T., and Rollins, K.M., 1991, Collapsible soil hazard map for the Cedar City, Utah area: Utah Geological Survey Contract Report 91-10, 37 p., 3 plates, scale 1:24,000. Harty, K.M, Mulvey, W.E., and Machette, M.N., 1997, Surficial geologic map of the Nephi segment of the Wasatch fault zone, eastern Juab County, Utah: Utah Geological Survey Map 170, 14 p. pamphlet, 1 plate, scale 1:50,000. Hiscock, A.I., and Hylland, M.D., 2015, Surface fault rupture hazard maps of the Levan and Fayette segments of the Wasatch fault zone, Juab and Sanpete Counties, Utah: Utah Geological Survey Open-File Report 640, 7 plates, scale 1:24,000. Hylland, M.D., and Machette, M.N., 2008, Surficial geologic map of the Levan and Fayette segments of the Wasatch fault zone, Juab and Sanpete Counties, Utah: Utah Geological Survey Map 229, 37 p. pamphlet, 1 plate, scale 1:50,000. Anderson, L.R., Keaton, J.R., and Rice, J.D., 1994, Liquefaction potential map for central Utah, complete technical report: Utah Geological Survey Contract Report 94-10, 134 p., 14 plates, scale 1:48,000. Owens, R.L., and Rollins, K.M., 1990, Collapsible soil hazard map for the southern Wasatch Front, Utah: Utah Geological Survey and Mineral Survey Miscellaneous Publication 90-1, 38 p., 3 plates, scale 1:48:000. Doelling, H.H., and Davis, F.D., 1989, The geology of Kane County, Utah: Utah Geological and Mineral Survey Bulletin 124, 192 p., 10 plates, scale 1:100,000. Lund, W.R., Knudsen, T.R., and Sharrow, D.L., 2010, Geologic hazards of the Zion National Park geologic-hazard study area, Washington and Kane Counties, Utah: Utah Geological Survey Special Study 133, 95 p., 9 plates, GIS data, DVD. Lake Bonneville deposits are associated with a variety of hazards such as liquefaction, landsliding, expansive and collapsible soils. Castleton, J.J., Erickson, B.A., McDonald, G.N., and Beukelman, G.S., 2018, Geologic Hazards of the Tickville Spring quadrangle, Salt Lake and Utah Counties, Utah: Utah Geological Survey Special Study 163, 25 p., 10 pl., scale 1:24,000. Castleton, J.J., Elliott, A.H., and McDonald, G.N., 2011, Geologic hazards of the Magna quadrangle, Salt Lake County, Utah: Utah Geological Survey Special Study 137, 73 p., 10 plates, scale 1:24,000, CD. Castleton, J.J., Elliott, A.H., and McDonald, G.N., 2014, Geologic hazards of the Copperton quadrangle, Salt Lake County, Utah: Utah Geological Survey Special Study 152, 24 p., 10 plates, scale 1:24,000, CD. Ashland, F.X., and McDonald, G.N., 2003, Interim map showing shear-wave-velocity characteristics of engineering geologic units in the Salt Lake City, Utah metropolitan area: Utah Geological Survey Open-File Report 424, 43 p., 1 plate, scale 1:75,000, compact disk. Solomon, B.J., 2004, Earthquake-hazards scenario for a M7 earthquake on the Salt Lake City segment of the Wasatch fault zone, Utah: Utah Geological Survey Special Study 111DM, 59 p., 6 plates, scale 1:250,000, compact disk. Utah Geological Survey Staff, 1990, Earthquake fault map of a portion of Salt Lake County, Utah: Utah Geological Survey Public Information Series 3, 2 p., 1 figure, approximate scale 1:120,000. Wong, I., Silva, W., Olig, S., Thomas, P., Wright, D., Ashland, F., Gregor, N., Pechmann, J., Dober, M., Christenson, G., and Gerth, R., 2002, Earthquake scenario and probabilistic ground-shaking maps for the Salt Lake City, Utah, metropolitan area: Utah Geological Survey Miscellaneous Publication 02-5, 50 p., 9 plates, compact disk. Wong, I., Silva, W., Wright, D., Olig, S., Ashland, F., Gregor, N., Christenson, G., Pechmann, J., Thomas, P., Dober, M., and Gerth, R., 2002, Ground-shaking map for a magnitude 7.0 earthquake on the Wasatch fault, Salt Lake City, Utah, metropolitan area: Utah Geological Survey Public Information Series 76, 1 p., 1 figure, approximate scale 1:43,500. Anderson, L.R., Keaton, J.R., Spitzley, J.E., and Allen, A.C., 1994, Liquefaction potential map for Salt Lake County, Utah, complete technical report: Utah Geological Survey Contract Report 94-9, 48 p. pamphlet, 9 plates, scales 1:24,000 and 1:48,000. Anderson, L.R., Keaton, J.R., and Eldredge, S.N., 1994, Liquefaction-potential map for a part of Salt Lake County, Utah: Utah Geological Survey Public Information Series 25, 2 p., scale 1:300,000. Black, B.D., 1996, Radon-hazard potential of western Salt Lake Valley, Salt Lake County, Utah: Utah Geological Survey Special Study 91, 27 p., 1 plate, scale 1:50,000. Black, B.D., 1996, Radon-hazard potential in western Salt Lake Valley, Salt Lake County, Utah: Utah Geological Survey Public Information Series 43, 2 p., 1 figure, approximate scale 1:83,300. Solomon, B.J., Black, B.D., Nielson, D.L., Finerfrock, D.L., Hultquist, J.D., and Linpei, C., 1994, Radon-hazard-potential areas in Sandy, Salt Lake County, and Provo, Utah County, Utah: Utah Geological Survey Special Study 85, 49 p., 30 figures, various scales. Solomon, B.J., 1993, Radon-hazard potential in the Sandy-Draper area, Salt Lake County, Utah: Utah Geological Survey Public Information Series 18, 2 p., 1 figure, approximate scale 1:38,500. Beukelman, Gregg S., Erickson, Ben A., and Giraud, Richard E., 2016, Landslide inventory map of the Sixmile Canyon and North Hollow area, Sanpete County, Utah: Utah Geological Survey Map 273DM, 1 pl., CD. McDonald, G.N., and Giraud, R.E., 2011, Landslide inventory map of Twelvemile Canyon, Sanpete County, Utah: Utah Geological Survey Map 247DM, 1:24,000 scale, CD. McDonald, G.N., and Giraud, R.E., 2015, Landslide inventory map of the upper Muddy Creek area, Sanpete and Sevier Counties, Utah: Utah Geological Survey Special Study 155, 1 pl. scale 1:24,000, CD. Giraud, R.E., 2004, Geologic hazards of Monroe City, Sevier County, Utah: Utah Geological Survey Special Study 110, 51 p., 4 plates, scale 1:10,000. Solomon, B.J., 1996, Radon-hazard potential of the central Sevier Valley, Sevier County, Utah: Utah Geological Survey Special Study 89, 48 p., 31 figures, approximate scale 1:250,000. Solomon, B.J., 1996, Radon-hazard potential in the central Sevier Valley, Sevier County, Utah: Utah Geological Survey Public Information Series 47, 2 p., 1 figure, approximate scale 1:161,300. Gill, H.E., and Lund, W.R., 1984, Engineering geology of Park City, Summit County, Utah: Utah Geological and Mineral Survey Special Study 66, 42 p., 15 figures, approximate scale 1:20,400. West, M.W., 1994, Paleoseismology of Utah, Volume 4 – Seismotectonics of north-central Utah and southwestern Wyoming: Utah Geological Survey Special Study 82, 93 p., 5 plates, scale 1:100,000. Black, B.D., Solomon, B.J., and Harty, K.M., 1999, Geology and geologic hazards of Tooele Valley and the West Desert Hazardous Industry Area, Tooele County, Utah: Utah Geological Survey Special Study 96, 65 p., 6 plates, scale 1:100,000. Solomon, B.J., and Black, B.D., 1995, Geologic hazards and land-use planning for Tooele Valley and the West Desert Hazardous Industry Area, Tooele County, Utah: Utah Geological Survey Open-File Report 318, 134 p., 56 plates, scale 1:24,000. Lund, W.R., editor, 1996, Paleoseismology of Utah Volume 6 – The Oquirrh fault zone, Tooele County, Utah – surficial geology and paleoseismicity: Utah Geological Survey Special Study 88, 64 p., 2 plates, scale 1:24,000. Utah Geological Survey, 2004, Earthquake fault map of a portion of Tooele County, Utah: Utah Geological Survey Public Information Series 84, 2 p., 1 figure, approximate scale 1:153,800. Utah Geological Survey, 2003, Liquefaction susceptibility map for Tooele Valley, Tooele County, Utah: Utah Geological Survey Public Information Series 80, 2 p., 1 figure, approximate scale 1:158,700. Black, B.D., and Solomon, B.J., 1996, Radon-hazard potential of the lower Weber River area, Tooele Valley, and southeastern Cache Valley, Cache, Davis, Tooele, and Weber Counties, Utah: Utah Geological Survey Special Study 90, 56 p., 1 plate, scales 1:50,000 and 1:100,000. Black, B.D., 1996, Radon-hazard potential in Tooele Valley, Tooele County, Utah: Utah Geological Survey Public Information Series 44, 2 p., 1 figure, approximate scale 1:86,200. Utah Geological Survey Staff, 1991, Earthquake fault map of a portion of Utah County, Utah: Utah Geological Survey Public Information Series 11, 2 p., 1 figure, approximate scale 1:181,000. Anderson, L.R., Keaton, J.R., and Bischoff, J.E., 1994, Liquefaction potential map for Utah County, Utah, complete technical report: Utah Geological Survey Contract Report 94-8, 46 p., 16 plates, scale 1:48,000. Anderson, L.R., Keaton, J.R., and Eldredge, S.N., 1994, Liquefaction-potential map for a part of Utah County, Utah: Utah Geological Survey Public Information Series 28, 2 p., scale 1:365,000. Solomon, B.J., 1993, Radon-hazard potential in the Provo-Orem area, Utah County, Utah: Utah Geological Survey Public Information Series 21, 2 p., 1 figure, approximate scale 1:33,300. Ashland, F.X., and Hylland, M.D., 1997, Preliminary geotechnical-engineering slope-stability investigation of the Pine Ridge landslide, Timber Lakes Estates, Wasatch County, Utah: Utah Geological Survey Report of Investigation 232, 33 p.
Hylland, M.D., Lowe, M., and Bishop, C.E., 1995, Engineering geologic map folio, western Wasatch County: Utah Geological Survey Open-File Report 319, 12 plates, scale 1:24,000. Christenson, G.E., and Deen, R.D., 1983, Engineering geology of the St. George area, Washington County, Utah: Utah Geological and Mineral Survey Special Study 58, 32 p., 2 plates, scales 1:31,250 and 1:60,000. Klauk, R.H., and Mulvey, W., 1986, Engineering geology for land-use planning for a parcel of state-owned land east of Washington, Washington County, Utah: Utah Geological and Mineral Survey Report of Investigation 212, 30 p., 17 figures, various scales. Knudsen, T.R., and Lund, W.R., 2014, Geologic hazards of the State Route 9 Corridor, La Verkin City to Town of Springdale, Washington County, Utah: Utah Geological Survey Special Study 148, 13 p., 9 plates, GIS data, DVD. Lund, W.R., Knudsen, T.R., Vice, G.S., and Shaw, L.M., 2008, Geologic hazards and adverse construction conditions, St. George-Hurricane Metropolitan Area, Washington County, Utah: Utah Geological Survey Special Study 127, variously paginated, 14 plates, scale 1:24,000, DVD-ROM. Solomon, B.J., 1996, Engineering geologic map folio, Springdale, Washington County, Utah: Utah Geological Survey Open-File Report 340, 6 plates, scale 1:14,400. Utah Geological Survey, 2004, Earthquake fault map of a portion of Washington County, Utah: Utah Geological Survey Public Information Series 85, 2 p., 2 figures, approximate scales 1:53,600 and 1:67,100. Solomon, B.J., 1995, Radon-hazard potential of the southern St. George basin, Washington County, and Ogden Valley, Weber County, Utah: Utah Geological Survey Special Study 87, 42 p., 27 figures, approximate scales 1:100,000 and 1:112,400. Solomon, B.J., 1996, Radon-hazard potential in the St. George area, Washington County, Utah: Utah Geological Survey Public Information Series 35, 2 p., 1 figure, approximate scale 1:72,000. Utah Geological Survey Staff, 1990, Earthquake fault map of a portion of Weber County, Utah: Utah Geological Survey Public Information Series 1, 2 p., 1 figure, approximate scale 1:71,400. Anderson, L.R., Keaton, J.R., and Eldredge, S.N., 1994, Liquefaction-potential map for a part of Weber County, Utah: Utah Geological Survey Public Information Series 27, 2 p., scale 1:200,000. Solomon, B.J., 1996, Radon-hazard potential in Ogden Valley, Weber County, Utah: Utah Geological Survey Public Information Series 36, 2 p., 1 figure, approximate scale 1:83,300. Geologic hazard publications may also be available. Bowman, Steve D., and Arabasz, Walter J., 2017, Utah earthquakes (1850–2016) and Quaternary faults: Utah Geological Survey Map 277, 1 plate, scale 1:500,000. Arabasz, Walter J., Burlacu, Relu, and Pechmann, James C., 2017, Earthquake database for Utah Geological Survey Map 277—Utah earthquakes (1850–2016) and Quaternary faults: Utah Geological Survey Open-file Report 667, 12 p.
Harty, K.M., compiler, 1998, Flood hazard from lakes and failure of dams in Utah: Utah Geological and Mineral Survey Map 111, 10 p., scale 1:750,000. Black, B.D., 1993, Radon-hazard-potential map of Utah: Utah Geological Survey Map 149, scale 1:1,000,000.